Wow, I just realized I really owe Katherine from Life with Arie a sincere apology. So, thank you, Katherine, you honor us with your recognition. Link back to the one who gave you this award. - Check. 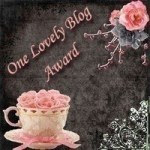 Pass the award on to 15 other lovely bloggers. - 15? Yikes! Follow the person who sent it to you. - Got it covered - We love Life with Arie! Now, I'm going to break the rules about the blogs I'm forwarding this on to. See, part of why it's taken me so long to get this written is that I can't manage the 15 blogs. It's not that I don't think there are 15 blogs out there worth nominating as there surely are. It's more that 15 feels a bit like a laundry list to me rather than a thoughtful and considered approach to blogs I really want to give recognition to at this time. Add to that my own rule of trying to give awards only to blogs I haven't recognized before and maybe you can understand why I'm changing the rules this time. So I'm only passing this award on to 5 other blogs. To those being nominated, I leave it to you as to whether or not you follow the rules as stated or make up your own. 24 Paws of Love - 2 packs, 6 dogs, 24 paws, endless possibilities. I love that the hu-folks at 24 Paws have never rushed, nor ever given up, on their dogs even when times get a little tough. We fully appreciate what it takes to do that. My Life in Blog Years - Formerly Dog Blogging with Luna, My Life in Blog Years details the adventures of Golden Retriever, Luna and Dachshund, Penny. Beautiful dogs, gorgeous photos, reviews and giveaways, and hand-made jewelry, too. Heart Like a Dog - Heart Like a Dog is Jodi Stone's recently redesigned and re-imagined blog. It chronicles her life with her two dogs: the well-adjusted, calm, sweet Sampson and his crazy, opposite, whirlwind of a step-sister, Delilah. There's a lot we can relate to here. Just Toby - Another blog that's undergone a transformation, Just Toby used to be Donna and the Dogs until Donna sort of stopped writing it and Toby, the yellow Lab stepped in to save the day (or blog, as it were.) Toby has a smashing sense of humor and shares his view of the world from his hu-folk ("The Ones Called...") and his siblings Leah and Meadow to evil trees and animals in need. With a fearful sister in the pack, there's lots for us to learn from him. Mayzie's Dog Blog - Mayzie is a beautiful brindle girl rescued and now living the good life with her people and her "brudder Ranger". Oh, and the kittehs, there are kittehs, too. Bella wants to know how Mayzie gets along so well with everybody. Maybe it's her sense of humor. Thanks again, Katherine, for the award. We're sorry it took us so long to tell you how much it meant to us. Congrats on your award, and thanks for passing it along to me. Hopefully, when The One Called Donna is finished with her crazy novel writing project, I'll be able to take back my computer and thank you for it publicly. For now, I will thank you here in this comment. Thank you Bella's peoples! You chose some great blogs to share it with! Congrats on your award! I definitely have trouble, sometimes, posting about/passing on any kind of awards in a timely manner. A big congratulation on your award! I too have some trouble at times getting awards acknowledged timely, so I know what you mean. Congrats on the award. I love your creative approach to passing it along--especially to bloggers who are trying to move their work to the next level. Nice idea. Thank you so much for our award and for all of your kind words. We appreciate them. Congratulations on your award as well. I love your tactful and honest manner. Beautiful! !